My dear long time friend Dakota enlisted my help to find two perfect Tennessee Walkers for herself and her husband Jason. After months of searching online she found her dream horse, an 11-year-old Rocky Mountain Spotted black-and-white gelding. At 17.2 hh, Big Ed was a tall horse. He was located in West Virginia. I am in Texas and Dakota is in Louisiana. Couldn’t she find a horse a little closer? But she thought he was the ONE. So we packed up and flew to Virginia. We made arrangements to stay at the farm/bed and breakfast where Big Ed was located. The owner had several horses for sale. I promised Dakota I would ride first to check for kid-safe horses, as it had been a very long time since she had ridden or owned a horse. We wanted solid, kid/husband safe, dead-broke, been-there-done-that animals. We were assured by the lady horse trader that all her horses were perfect for us. Now I know this to be a red flag but Dakota was determined to check out Big Ed. Dusk was falling as we drove up to the West Virginia farmhouse. We were late as we got lost looking for a liquor store. After all it was supposed to be in the freezing numbers and we needed something to keep us warm and cozy. The farm was nestled in front of snow capped mountains. White wood fences separated several horses of all shapes and color. There was a large red barn and a white two-story farmhouse with blue trim and shutters. We planned to stay for a whole week to ride and thoroughly examine enough horses that we could come away with two perfect horses. We would make arrangements to have them shipped at a later date. As we approached the farmhouse we were greeted by a couple of barking dogs. The owner/trainer/horse trader Angela greeted us at the door. A striking woman with shoulder-length dark brown hair, she had a warm friendly smile that confirmed we’d made the right decision, or so we thought. Everything she had told us in the emails and phone conversations was true, so far. Our minds changed quickly as we entered the charming old farmhouse. The first sensation was an all-too-familiar odor of cat box. We saw at least six cats and three or four dogs. They were all over the furniture. Angela was giving us a tour and attempting to make us feel at home by showing us where everything was in the kitchen. However in the kitchen there were cat food bowls on top of the counters and on the dining table to keep the dogs from eating the cat food. There were piles of trash on the floor. One for recycle and the other just trash. Then she showed us to our rooms. We each had our own room and shared a bath. They were actually nice and clean, it appeared so anyway. Which was nicer than I originally expected. I assumed I would be sharing a bed with Dakota. Angela told us to be sure and keep our doors closed at all times as the cats have been known to pee in guests luggage. So far, I have red flags going off in my head all over the place. I gave Dakota a jab in the ribs every chance I got. As we got acquainted with Angela, she informed us she rescued animals of all kinds. Of course she did. She even had a sick chicken she was nursing back to health. No surprise there. Angela excused herself and returned with the sick chicken. It had an inflamed, weepy eye and cooed in a pathetic way as Angela treated the eye and administered drops of some sort. We were repulsed and amazed as she treated her at the kitchen table. The next morning we bundled up, thank goodness we came prepared at it was just below freezing. We headed out to the barn to meet her trainer who was tacking up the horses. She would be our trail guide for the day. She was a small, leathery gal and even with all her winter clothing on, it was clear she was very fit. I was impressed that Jennifer had a friendly and gentle way with the horses. Angela, Dakota and I went out to one of the pastures to catch Goldie Hahn, a beautiful palomino 15H Tennessee Walker mare, eight years old and reportedly the most kid-safe. Angela handed the halter to Dakota and asked her to halter Goldie Hahn, which she did with no issues. We walked back toward the barn with Goldie Hahn following behind. Suddenly Dakota jumped and yelled, “She bit me in the back!” Fortunately, she was wearing layers and a very heavy jacket. Angela chuckled and said, “Oh, that just means she likes you.” I gave Dakota another elbow to the ribs. We caught three horses we were to ride and started the bonding process by grooming and tacking them up. Two of these horses had just come in from Tennessee two days before. She said she just had their feet trimmed and teeth floated just the day before. This was another red flag to me. Angela didn’t know these horses and they hadn’t even had time to settle in. I was to ride Gentleman Jack. A nice gelding about 15H and 9 years old. I put my face to his muzzle and gently blew in his nostril. I guess he didn’t like this and he let me know with a bite to my hat. Not a great start to our first ride. Two horses that bite? I’m sure he was horribly upset at being moved and in a day, put through the ringer and then introduced to two southern girls. But we moved forward. We took the horses out of the barn to mount up. Dakota mounted Goldie Hahn with no problem. I got on Gentlemen Jack and he wasn’t happy. Jennifer mounted Big Ed. Gentleman Jack was very nervous already, and when he saw Big Ed he started getting very jumpy. Angela said he’s probably never seen a horse that big before. No doubt. He stamped his feet around so I did what I know best, I pulled him into a one-rein stop and then dismounted. Not this one. Let’s try another ‘kid-safe horse’, please. I might have been able to get him settled in but this was a horse for Dakota or her husband. There was absolutely no reason for me to go any further with this horse. They got me another horse and we actually had a lovely ride up in the mountains. After our morning ride we had a little lunch. Back at the barn we tacked up the horses again, loaded them in a trailer and took them to the neighboring farm across the street. Angela followed us in her car. She was taking video and pictures of our rides. Dakota was still in love with Big Ed. I kept asking, “Are you sure you want him?” “Oh, yes,” she kept saying in her adorable southern accent. “Heee jus has tha saweeeetest personowlity.” This meant I had to ride him. After all, that’s what I was there for. Honestly at my age I wasn’t looking forward to getting on Big Ed. He was so tall, I felt as if I was on a giant. Actually, he was very sweet, but I knew right off he was too much horse for Dakota. He was very forward-moving and he would break into a canter easily. 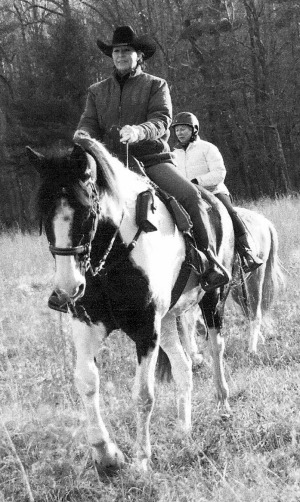 For Dakota, I wanted a nice, easy-moving, gaited horse that didn’t like to canter. And, yet again I wouldn’t call Big Ed ‘kid-safe’. We rode up into the mountains and through some trails. It was actually a lot of fun. 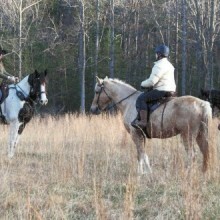 Soon we came to a clearing where we each gaited the horses around in a flat field. Angela showed up in her car and took video of us. It was time to head back to the trailer when I heard Dakota behind me yell out. I looked back and she was on the ground, crying. She had come off Goldie Hahn right on her tailbone. I’m so glad she had her helmet on. But she didn’t hit that end anyway. Certainly not a great end to our first day of riding. she said she had no idea what happened. She said she wanted to go one way and Goldie wanted to go another and she said next thing she knew she hit the ground hard. I got Angela to ride Goldie and Dakota drove the car back. Back at the farmhouse Angela offered her Jacuzzi tub to Dakota. She gladly took her up on her offer. I went in the bathroom to take her nice scotch on the rocks and a couple aspirin and there she sat like a queen, with bubbles up to her chin. She was finally warm and relaxed in the gentle, flowing water. For a moment, I thought all was well. Suddenly, I heard a weird noise coming from behind me. I turned to look and there, behind the toilet was the sick chicken. Not moving except to take a shallow breath and let out a soft chicken groan. It was shocking to see it was not in a cage, not even on newspaper! Just right there on the tile floor behind the toilet the chicken cowered. Chicken poo at one end and crumbs of some sort at the other. I wish I had taken a photo. Here was Dakota ensconced like a queen in a luxurious bubble bath, and there was the pathetically croaking sickly chicken sitting in its own filth in the corner behind the toilet just feet away. Dakota gave me a look that shouted without words, “Get me out of here ASAP!” We left the next morning. We continued our quest to find a couple good horses. Lesson learned, there are horse trader and there are ‘horse traders’. I urge you if you are thinking about buying a horse for the first time, please talk to a horse friend or trainer and have them go with you before you buy. And never purchase off the internet with out riding first and checking the horse out. We actually did eventually find the perfect horses. One her husband found in Louisiana and I found one in Texas. The one I found was everything the breeder/owner said she was. That was the most push-button horse I’d ever ridden. They wound up with two wonderful horses they have to this day.